Lidar is often used in robotics to detect objects obstructing the robot’s path and allow the robot to plan an alternative route around the obstacle to avoid collision. In a growing number of indoor robotics applications, it is also necessary for mobile robots to be able to detect and avoid drop-offs that the robot could tumble down which could result in damage to the robot, loss of function, or even human injury. For example, a service robot operating in a hotel would need to avoid multiple staircases that it could fall down. Virtually any mobile platform will encounter some form of negative obstacle on its route—including stairs, docks, ledges, potholes, etc.—which can be challenging for a robot to adapt to. 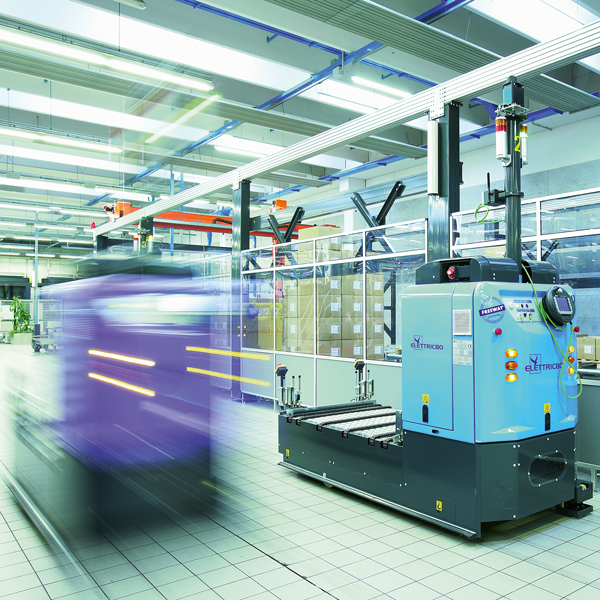 Below are three possible solutions to help ensure indoor service and industrial robots can safely navigate around drop-offs. One initial solution to the problem of negative obstacles is to program your robot’s navigation system to avoid the area of the drop-off by defining the surrounding space as “no-go” area on the map. The no-go area would need to be defined for each drop-off, but this solution can usually be accomplished using existing hardware and software. However, simply blocking the area from the map may not be sufficient to keep the robot safely on solid ground at all times. For example, if the robot becomes confused or disoriented, this solution does nothing to actively prevent the robot from falling down the stairs. Rather, mobile robots designed for dynamic environments require an active system to detect and avoid potential pitfalls. One example of an active system involves installing two distance sensors on either side of the robot to detect changes in the distance between the robot and the ground. The sensors actively monitor changes in distance, allowing the robot to actively navigate around drop-offs. While this solution is better than simply programming a no-go area, a distance sensor solution is still not entirely foolproof because it relies on two static points of reference (one for each sensor), which means the robot could still be tripped by smaller negative obstacles. For example, if a robot is navigating over a pothole, the distance sensors may detect the ground on either side of the pothole but miss the hole, which could trip the robot’s wheels. An ideal solution would feature a scanning range that would allow the robot to detect even small negative obstacles (like potholes) and navigate around them to avoid falling or getting stuck. Ideally, if you are designing a new robot for use around stairs or want a more reliable solution retrofitted to your existing robot, what you need is a navigational system with a scanning range that allows the robot to continuously monitor the presence of the floor and intelligently avoid negative obstacles. This type of situational awareness allows the robot to recognize negative obstacles in advance and actively plan a route around the negative obstacle. For this solution, you will need Lidar that can be programmed using contour as reference—such as theTiM351 laser scanner from SICK. What this means is that the laser scanner is programmed to constantly look for the surface of the floor. If the scanner cannot detect the floor, the scanner will tell the robot to stop, turn around, etc., actively preventing the robot from approaching an unsafe drop-off. While there are several solutions to help a robot avoid drop offs and other potential pitfalls along its route, in most cases, an active solution is best—because it allows the robot to make ad hoc decisions in dynamic environments. This post was originally published in Lidar News and is republished by permission.